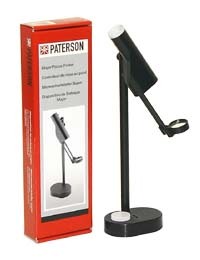 The Paterson Major Focus Finder provides accurate focusing on the image grain of the negative under high magnification. It is designed for easy focusing of big enlargements, but can be used for magnifications as small as 3½x. The tall design allows focusing controls to be reached without uncomfortable stretching. Approximately 13½" tall. Supplied with eyepiece cap.